Norwex is an opportunity for you to start your home-based business for yourself, but not by yourself! It is the fastest-growing direct-sales business that is driven by its mission, “to improve quality of life by radically reducing chemicals in our homes.” It fulfills this by offering superior, easy-to-use, environmentally-friendly cleaning and personal care products that save people time and money. Norwex also gets involved with causes that support their mission. 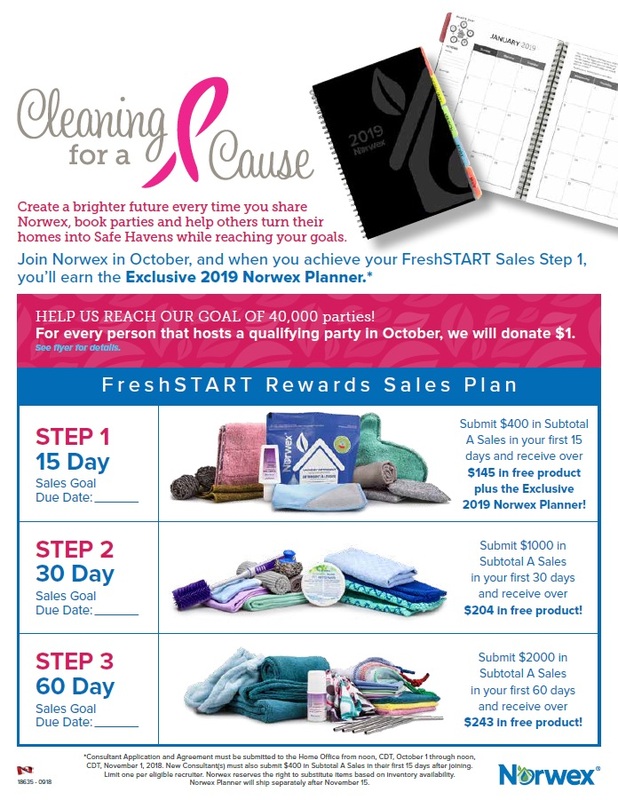 This month the Norwex Foundation for a Brighter Future has a goal to donate $40,000 to help fight breast cancer! Norwex is extremely generous, to consultants, host and our communities. In the last five years, they have donated over a million dollars to consultant nominated charities! It’s a great time to join and be part of this amazing company!! I have been a Norwex Independent Sales Consultant since 2006. What I love about my home-based Norwex business is that it gives me and my family flexibility, my business has grown from a desire to pay a few bills to a full-time career with AWESOME benefits and rewards, being involved with Norwex has opened my eyes to importance using natural products and that how we live makes a huge impact on our health and our environment. If you love the product and have the heart to educate others and change the world, Norwex is for you! I am honoured to invite you to try Norwex. 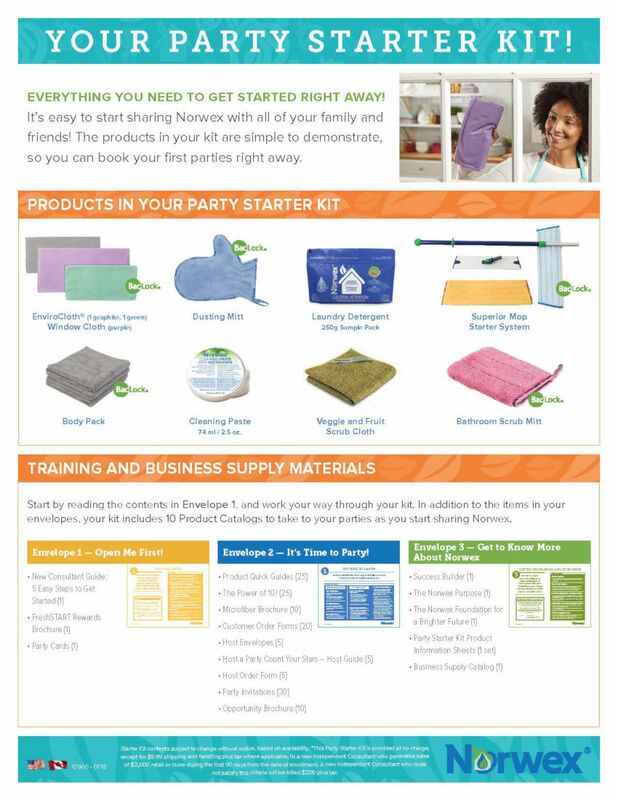 The Standard Party Starter Kit is just like its name says… It is a fantastic kit of Norwex products that will equip you to be ready to launch your business and have successful parties. It has top-selling products, like the EnviroCloth, Dusting Mitt, Cleaning Paste and even the Mop System. It also comes with essential business supplies so that that you can be confident you have all you need at your first parties. Direct Sales works best when you have products for customers to try. You will sell more EnviroCloths if demonstrate how the microfiber cloths work to clean a surface (instead of just talking about it). I often use a smear a little butter on a window to show how the microfiber easily cleans a greasy surface and leaves it streak free. It’s the best way to sell this stuff! How much does it cost to get my business started? The Standard Kit Party Starter kit costs $200. 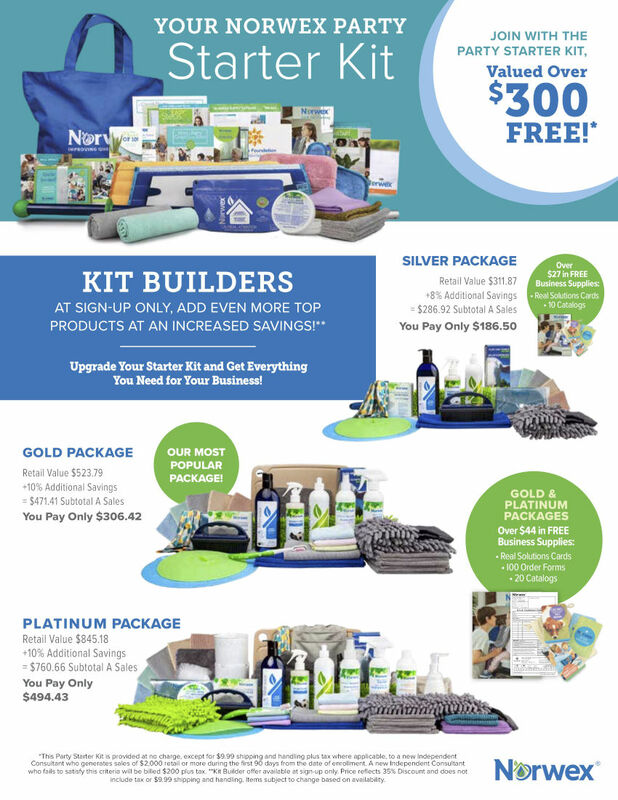 The kit itself has more than $300 worth of product and business supplies. In fact, Norwex will take your credit card information, when you sign up… but they actually don’t want to charge you. 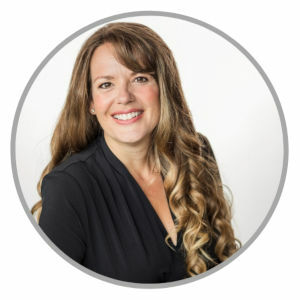 They help their new consultants have a strong to their business by offering amazing start-up incentive programs (keep reading), 35% commission starting on your first sale and the opportunity to earn your Standard Party Starter Kit for free. When you sell $2000 of product (retail) in your first 90 days of a business, you will receive the kit for FREE… plus you’ll have earned 35% commission of $700. But that is not all you’ll earn…keep reading! You can book 2 launch parties (at your home or on Facebook) and 2 additional parties (ask your friend and family) in your first 90 days of business. To break it down a bit: You will receive Host Rewards (as the host of your launch parties), 35% Commission, earn FreshSTART rewards (keep reading) and earn money towards your $2000 Sales Goal. Invite EVERYONE you know, use social media, make a friendly call, get your mom to invite her friends, even approach your distant relatives as Norwex will ship anywhere in Canada. An average party sells approximately $500. So from your launch parties, you will need to secure 2 more parties to earn that Standard Party Starter Kit (plus more). We all have our sphere of influence… once you reach your people, their sphere of influence will help you widen your reach! What is this incentive program all about? 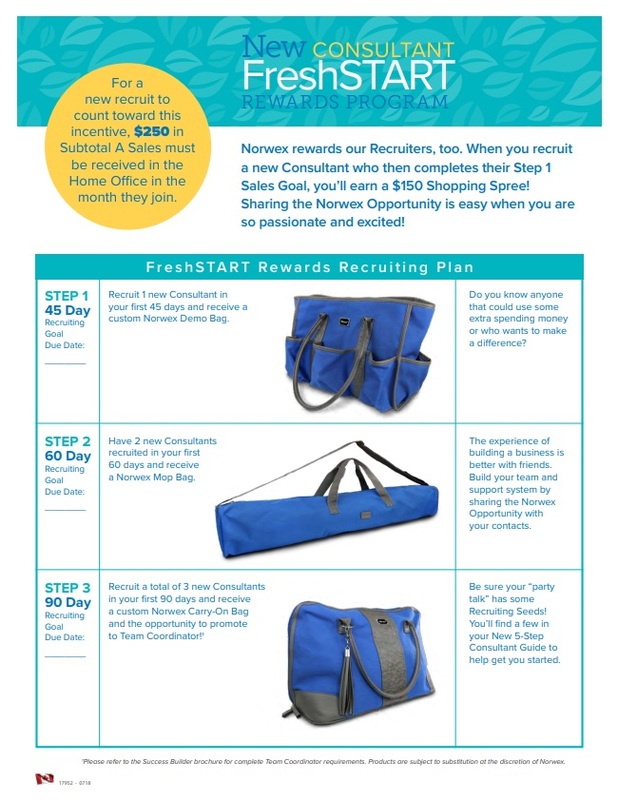 Norwex’s FreshSTART program is only available for new consultants. It is designed to help you develop sales and team building business goals and get rewarded for accomplishing them. Building a diverse demonstration kit is important for new consultants and by participating in the FreshSTART program, you will be well on your way. When you have lots of product, you can use it for demonstrations, but you can also use it in your home as well as for party gifts!!! This program is amazing… when you complete all 3 steps, you will earn $700 Income (35% commission), $592 Free Product and plus the Standard Party Starter Kit! In my experience, I have found that new consultants who actually use a variety of Norwex products in their home… sell more! Having a hands-on experience and a love for the product is the stuff that makes you believable and a great salesperson. What is a Kit Builder? A Kit Builder is a great way for New Consultants to get more product at a great price! There are 3 kit options, but my favourite is the Gold Package. First, it is stocked with a variety of product and business supplies. Second, you receive it at 45% off retail price. Third, by buying it you earn your Step 1 FreshSTART Sales Goal (submit $400 in the first 15 days of business) which qualifies you to receive an additional $135 in FREE Product. Whichever kit builder you choose, it will bless your business. How do I start growing my Norwex business? The FreshSTART program also rewards new consultants for growing your business from the start by recruiting others. If you are thinking, “How can I grow my business when I just started it?” I get it. I remember my first party (nerves, sweaty palms and all)… but I also know that it’s better to grow your business together. Do you know anyone who loves Norwex products? Do you know anyone who needs an extra income? 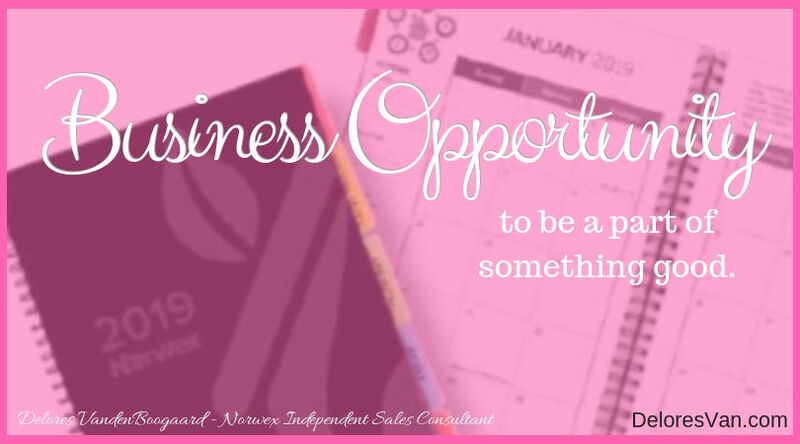 Why not offer this Norwex opportunity to them and grow your businesses together? Norwex allows people to dream, to be a part of a some great, to be in control of how much you work and when you work. Norwex not only rewards their new consultants but continues to support them throughout their business with incentive trips, free product, great training, supportive online help… the list goes on. Like I mentioned above, Norwex is about changing the world by offering products that are safe for us and for the environment. They do lots of cool stuff in our communities (like support Breast Cancer Research) and treat their consultants like gold. If you could dream, what would your future look like?